There are some pretty cool Dark Souls-inspired loot out there in the real world to help us keep our love of this brutally unforgiving franchise close to our hearts. 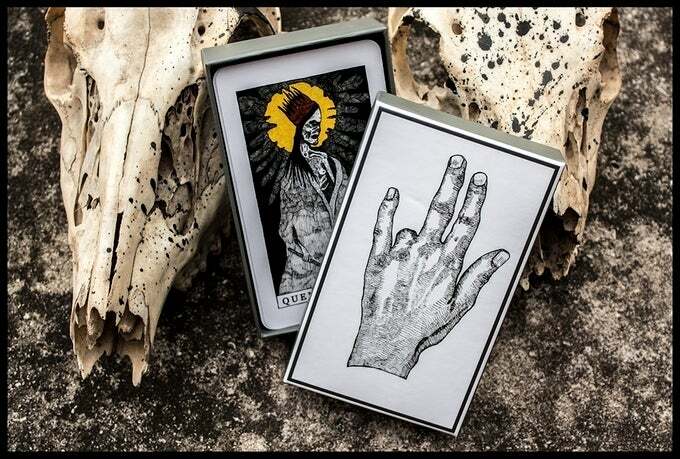 One of the latest installments courtesy of fandom love comes from Chicago artist Winslow Dumaine and his inspired Tarot deck is something that definitely has our attention! His deck includes both Dark Souls and Bloodborne franchises and in short - it's stunning! "The Tarot Restless is an overhaul of the classic Rider-Waite tarot deck. While the suits of the Minor Arcana remain the same, many of the Major Arcana are new creations. The cards feature hand-drawn artwork depicting scenes from a dark fantasy story set in the midst of an infertility apocalypse. Accompanying the deck, Restless Meditations is a 100 page book of short stories that explore the lore and interpretations of each card. The cards shown in the video and photos are from the promotional version of the deck. Those decks were printed with 310gsm linen stock and a standard gloss finish. They are very smooth and slide very easily, while retaining a slight texture. See the Stretch Goals section for how I would like the final version to look. The cards come in a rigid, two part box with art on the top and bottom. The box has a matte finish. Accompanying The Tarot Restless is a copy of Restless Meditations. This is a complete guidebook to using The Tarot Restless, including instructions on how to perform an Inimical Reading, as well as a short story written to explain the lore for every card. The purpose of this work is to guide people as they confront their pain and grief. For this reason, some of the cards tend to be macabre or bizarre. It is not a wholly morbid work, though: the themes of revenge, betrayal, and suffering are balanced by those of empowerment, extrication, and relief." The full deck is available now for pre-order with a number of different pledges to score a deck of your own. The project is fully funded and well into their third stretch goal - don't forget to check it out for yourself right here! Don't forget to also support the artist over on his official website!